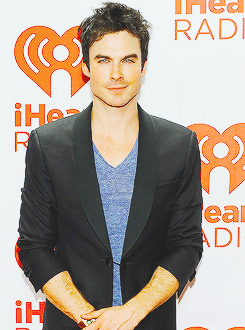 Ian, Candice, Claire and Kat attend iHeartRadio Music Festival (Sept 21, 2013) . Ian Somerhalder, Candice Accola, Claire Holt and Kat Graham attend iHeartRadio Music Festival (Sept 21, 2013) . Wallpaper and background images in the The Vampire Diaries club tagged: ian somerhalder candice accola claire holt kat graham the vampire diaries. This The Vampire Diaries photo contains business suit, suit, suit of clothes, well dressed person, suit, pants suit, and pantsuit. There might also be three piece suit, slack suit, two piece, two piece suit, and lounge suit.